is the best way to reach the Stanford community. There are untapped markets that are looking for services like yours. 27,000 students, faculty, and staff on campus read our publication. The businesses that they go to are the ones that are in our newspaper. We can help you be that business. 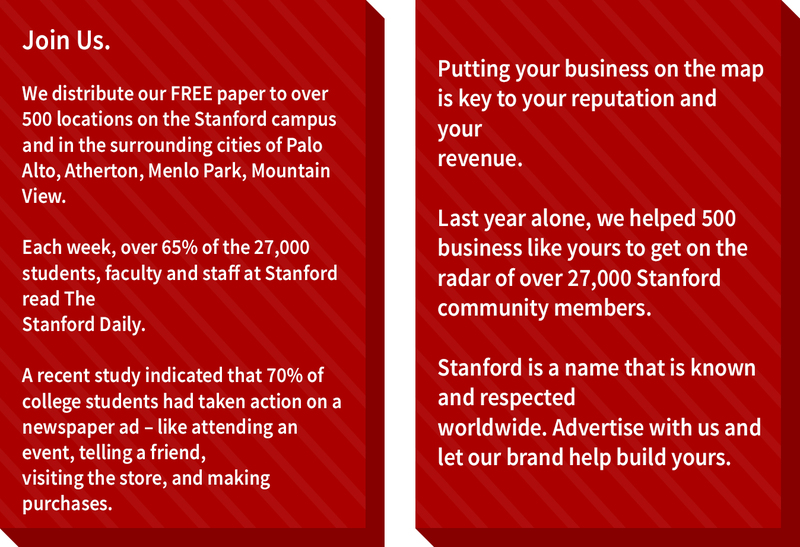 We look forward to connecting your business with Stanford. Interested in getting your classified ad in front of thousands of Stanford community members?! Post your ad copy now through our user-friendly website. 9. Appear in The Stanford Daily Classified Section on your chosen run dates! Please contact us at advertising@stanforddaily.com if you have any questions or to request information about our rates and various offerings! posting the actual rates on this page would be helpful, rather than requiring an interested party to make a phone call or send an email to discover what the rates are. Yes, and thank you, Dr. Koran. I was thinking the same thing. as Dr. Koran. I am here inquiring about advertising in the paper for my business. Most of the other college newspapers have rate information available on the websites.